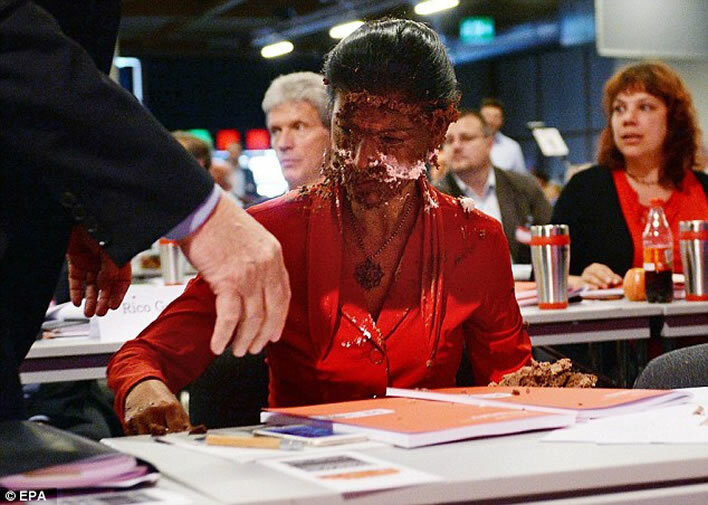 For Sahra[sic] Wagenknecht, the German politician underneath that layer of brown cake, we on this blog have no time at all: she is a fantasist and political lunatic of the first order. Nevertheless, she should not have been physically assaulted. For the cake thrower we have no sympathy at all: what he did was just mindless common assault – how can the victim possibly know in the moment of the attack and its aftermath that the cake is harmless? We must hope that this person – whose identity is surely known – is arrested, charged, tried and punished in a way that will deter others from assaulting public figures. One of the key characteristics of the political turmoil that led up to the Nazi terror was the use of violence as a means of intimidating political opponents. Come on, Germany – you of all countries should understand this. We are, admittedly, nowhere near that dismal state, but physical assault and humilition is a step in the wrong direction. The fact that a brown cake is used instead of the traditional white, comedic, cream cake may have dark implications that are too deep for us to explore for the moment, but which have been noted by others, if only jokingly. East Germany? Let's have more of that. She is indeed a political lunatic, one of those strange specimens who grew up in East Germany (GDR) but who, after the belljar was lifted off that benighted country, decided that communism really was best, despite all they had seen and experienced. We in the West had always known that conditions in the GDR were grim, but mostly as an intellectual concept. Then, after the borders were opened in 1989 we met the crumpled specimens of East Germans who arrived in West Germany – the 'Ossies' – face to face. We observed the poor quality of their clothes, their shabbiness, their unhealthy appearance, their bad teeth, their amazement at the easy availability and cheapness of all kinds of foods – bananas, for Heaven's sake! We noted their willingness to work but their frequent unwillingness to use any personal initiative in their jobs: that had never been the GDR way. Two astonishingly separate worlds of mutual incomprehension but shared language suddenly met each other. Our caked person, who if we believe her vague accounts had her own troubles with that awful regime, comes blinking into the light after the opening up of East Germany, a twenty year old, and decides that Communism is best: she has even fought and lost a lawsuit to stop the word 'neo-Stalinist' being applied to her. It is difficult to think what else to call someone who refuses to condemn that monster Stalin and expresses solidarity with those monsters Castro and Chavez, dictators who have all brought death, famine and the most extreme misery to the poor people they were supposedly representing. 'Political lunatic' seems rather mild, when we see the current reports and images of the desperation of the people of Venezuela. After the reunification of Germany she played her part in the name convulsions – the 'PDS', the 'WASG', 'The Left' – through which the zombie Communists of the old East Germany mutated in order to try to regain some political meaning in the new republic. Now 46, she has reached the towering heights of co-deputy leader of the party 'The Left'. She has also married Oskar Lafontaine, 26 years her senior – the mention of whose scandal-ridden name will make any at least half-sane observer of German politics shudder in wonderment that this particular zombie is still walking the earth. Oh, and she has also recently written a book arguing for more state control, a theme which has got the crypto-Marxist intellectuals in Germany gurgling with pleasure. For the first 40 years of her life her name on her birth certificate was 'Sarah Wagenknecht'. Presumably that is the name under which she was enrolled at school, at university and in all her official positions of life. As far as we know every passport, every residence document stated 'Sarah'. At some point in the past she decided her first name should be 'Sahra', a name she used from then on to what must have been the continual consternation of journalists, sub-editors, officials and anyone who had to hear 'Sarah' and write 'Sahra'. The German pronunciation of 'Sarah' is 'S-ah-ra' not 'S-air-a', so 'Sahra' is phonetically indistinguishable from 'Sarah'. However, when she was elected to the German Parliament in 2009 the administration, to whom such things as the use of real names is understandably quite important, stamped its foot: she changed her forename formally to 'Sahra', thus officially perpetuating this oddity. From where did she get this strange orthography? Her father was an Iranian student in West Berlin, who impregnated her mother during one of the 24-hour visa visits to East Berlin. In 1972, when Sahra was three, his residence permit expired and he returned to Iran, never to be seen again. Both mother and daughter like to believe that he met a romantically tragic end in a 'torture cell of the Mullah-Regime' (which didn't come to power in Iran until 1979). If so, perhaps he had been a supporter of the Shah? The father's first choice for his daughter's name was 'Rosa', which would have given her real communist credibility in later life, but for some reason her mother decided to go with their shared second preference 'Sarah'. In order to reflect the father's rasping pronunciation of the 'r', the mother had the bright idea of moving the terminal 'h' in front of the 'r' to give 'Sahra', thus creating one of those extremely annoying 'normal' names which are written abnormally: 'Jon' for 'John' comes to mind, as do all those irritating Celtic variants of 'David', 'Ewan' and 'Ian', not to mention all the modern 'Kaylees' and so forth. To egocentric misspelling we now have to add victimhood. The midwife was a 'dragoon' who wrote 'Sarah' on the tag on the baby's leg, despite the mother's explicit request to spell it 'Sahra' - 'There's no such name' she is supposed to have told the mother. Quite so. She was right, and should have been listened to. The mother was too exhausted from the birth to argue with this termagant. She was seemingly still too exhausted to argue when it came to officially registering the name of the baby and on all the other occasions when 'Sarah' was used. The name was supposed to memorialise the father by mimicking his defective pronunciation. Why didn't they just call the baby 'Rosa', which had anyway been the father's first choice? Why blame an unknown midwife all those years ago in 1969 for writing what every normal person would write on hearing the name 'Sarah': write S-A-R-A-H? Did the midwife write the birth certificate, too? The whole tale is impenetrable fantasy. Sahra[sic] Wagenknecht has form for rewriting and managing history. In addition to legal interventions to suppress articles and photos she disliked, a few years ago she was part of a group of left-wing MEPs that shared an 'opulent lobster dinner' in a fine restaurant in Strasbourg. That's how they live in the EUSSR, just like the good old days of the communist Nomenklatura. One of the group took some pictures of the event. Wagenknecht's assistant borrowed the camera under a pretext the following day. When it was returned the photos of Wagenknecht at the dinner had been deleted. Wagenknecht admitted deleting the photos. The photographer was understandably annoyed that her private photos on her private camera had been searched through and some deleted, but she should have known better: You can take the girl out of the GDR but you can't take the GDR out of the girl. Despite all this we still don't approve of cake-throwing. Common abuse and insults would have been quite sufficient.